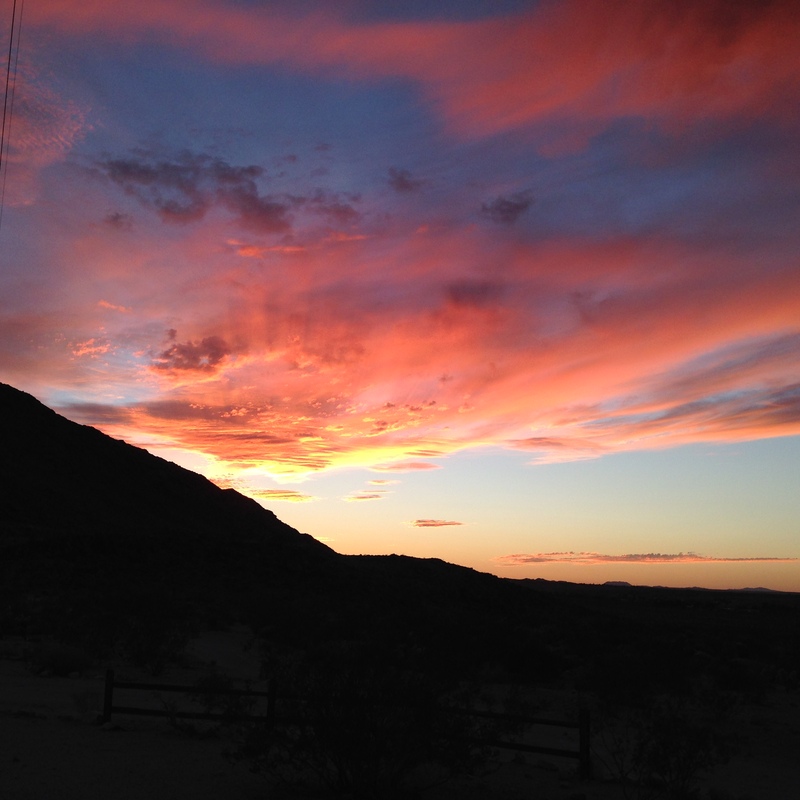 I think the best time of year to be anyplace is fall, but it is especially beautiful in the Mojave Desert. The cool autumn mornings after the blinding heat of summer are as refreshing as a waterfall shower. Doors and windows wide open; to breezes and all the possibilities that the day holds. I haven’t written on this site for a couple of years but I thought maybe I’d give it another try. Reading my cousin‘s husband‘s blog about their six month sojourn to Europe has rekindled my word press interest. I’ll try to include a link to their blog here if I remember how! Allen and I will not be participating in the Hwy 62 Art Tours, but we hope you enjoy venturing out and visiting the other artists in their studios. My art is on display at the Twentynine Palms Creative Center and Gallery 29 Palms. I have been so long away from this blog, I would be surprised if anyone was still following it! If you are, thank you for being so patient with me. Allen and I took a year off from doing the Hwy 62 Art Tours and that freed us up for traveling. We got back recently from a fabulous fall foliage trip to New England. The change of scenery was refreshing one and it acted like a jumpstart on my creativity. Then, as soon as we returned we toured as many artists’ studios on the Hwy 62 tours as we could fit in both Saturdays and I helped Karine Swenson with sales in her open studio on both Sundays. 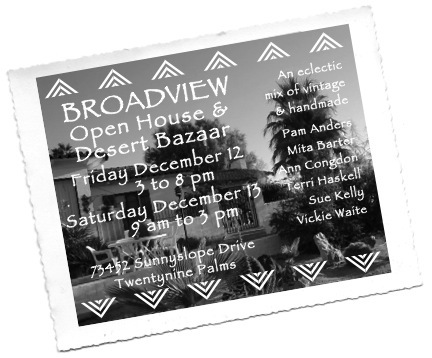 A few days later Ann Congdon invited me to be part of the upcoming Broadview Open House and Desert Bazaar. This event will be an unusual and exciting mix of Vintage and Handmade, hosted by 6 eclectic women from 29 Palms; Ann Congdon, Pam Anders, Vickie Waite, Sue Kelly, Terri Haskell and myself. In one of my new Technicolor series, I continue to explore with texture and shape first, then color. If you wish, please bring a remembrance to add to our Dias de Los Muertos Shrine. From Hwy 62 turn Right (S) on Adobe Road, turn Left (E) on Baseline, turn Right (S) on Desert Knoll (dirt) and Right on Twilight Drive. The studio is behind the orange house. Do not fall in love, this is just the 2nd or 3rd layer in what will have 6 or 7 layers. Someone asked me why I include the pattern pieces’ words which will most likely be completely obscured in the finished product. My answer: My mother was a water colorist, a graphic illustrator and a seamstress, I grew up surrounded by paints, ink wells, and pattern pieces, when I include a snippet of tissue with a fragment of words from one of these old patterns, I am including my mother in my creative process. The building of a casino in front of our house in the desert, the bedroom addition being added to our little cabin in Big Bear, the random rodents with plague found in the neighboring mountain communities, the bread I bought at Trader Joe’s on Monday that is covered with mold today, the planning and implementation of The Joshua Tree National Park Art Show and Faire. Guess I must not be a TRUE artist because everything else comes first,. Also, I am not starving, I don’t need to sell my slightly used Hasselblad Stellar to buy food for my rare speckled guinea pigs. 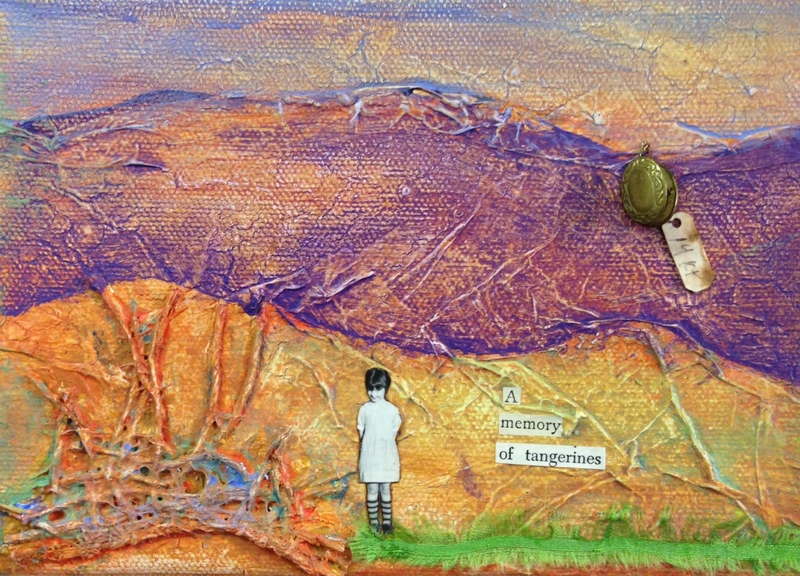 I do not stay up all night worrying about if my art is au courant, and I love being interrupted to chat with friends. Thank you Perry Hoffman for creating the above postcard! 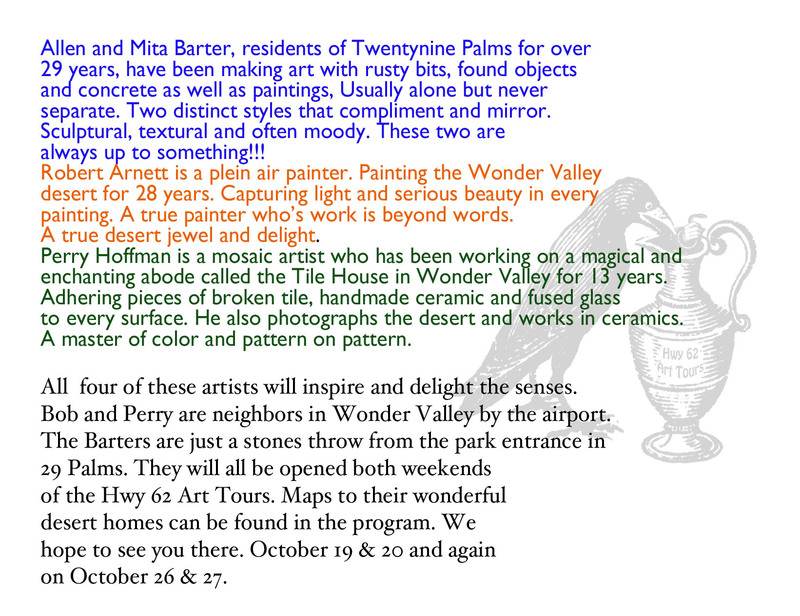 On a brighter note, Allen and I will be opening our studios for BOTH weekends of the Hwy 62 Art Tours !The last two weekends in October are a beautiful time to visit the desert, we will share our latest creations with you, some food and drink and a viewing platform to observe the progress (sic) of the casino. I promise to be in a more cheerful mood by then!